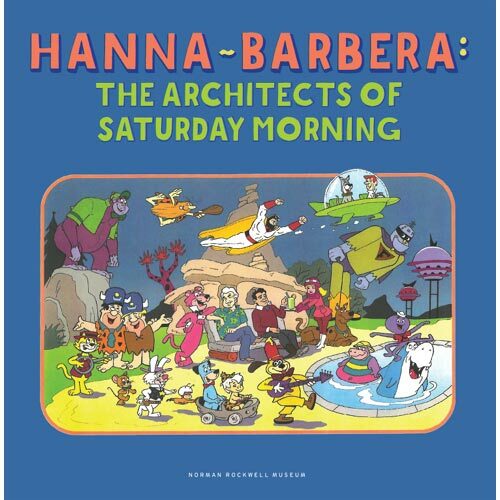 Exlusive catalog to the exhibition Hanna-Barbera: The Architects of Saturday Morning by Norman Rockwell Museum Curator of Exhibitions Jesse Kowalski, with foreword by Jayne Barbera and essays by animation historians Jerry Beck and Michael Mallory. Hanna-Barbera: The Architects of Saturday Morning is the first museum exhibition on the world's most successful animation partnership, providing a glimpse of the extraordinary story of how two astute businessmen reacted to a dying film animation industry and revolutionized the format of television. From 1958 through the 1980s, a majority of cartoons bore the Hanna-Barbera imprint. Creating scores of popular series such as The Flintstones, The Jetsons, Jonny Quest, Scooby-Doo, and Super Friends.